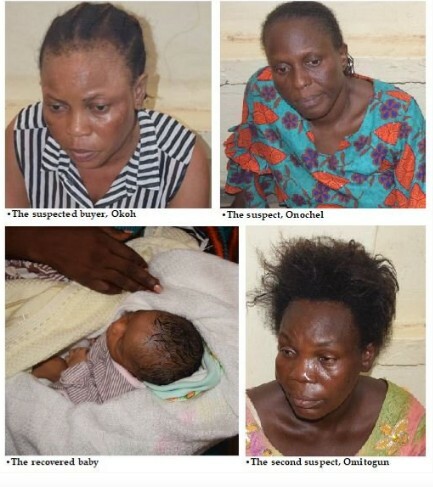 Two nurses working at Trinity Clinic, Meiran, Lagos, gas been arrested by the Lagos State Police command for allegedly selling a woman’s baby and deceiving her that she had a stillbirth. The police spokesman Bala Elkana, a Deputy Superintendent (DSP), cinfirmed the arrest and that the baby had been recovered from the buyer. A woman like you went through pains to carry & birth her child and you came from nowhere to steal her joy. Nonsense. Unfortunate human beings! see their stupid ugly faces. I support jungle justice in this kind of case. You cannot take away someone's joy to service your own desperation. You could have adopted or get a surrogate. Let the law take its course. Wicked nurse,may dey rot in jail,tank God d baby was rescued,to d woman dt bought d baby,y can't u go d legal way to adopt a child,d mony u will spent there may nt be up to dis,may God put ur shame to fame. Hmmmm... Wrote a script with this same storyline a long time ago.. Wanted to go into movie production but fell into the wrong hands... I will really love that to see that script come to screen though... You don't wrong another to set things right, wrong will always be wrong. Naija nosu, unu n' eyi egwu oooooooo! make I no talk again o. Make I no receive thunder today. I go yarn am another day. You are mentally unstable ..u really need...u are a pervert. Even when I no talk, you still send ya perverted thunder eh? Okay, na me sell babies now lie say im head been scatter eh? Abi na me release the news? Naija nosu dey FIND husband from admitted patients inside ward. My husband been dey admission one time like dat. Me, I no dey town and na im friend; a guy dey visit am. Okay as I return, come visit am and im call me darling. "Is this fine man ya husband?" I nodded -the woman na married woman wey dey older than me. talk I write there. She wan tie my husband (for babalawo na) give im younger sister? E don reach where husbands or at least one relation go dey labour room with pregnant women now o. O gini di? How can you sell someone's bundle of joy for just 350K?? Madam buyer why didn't you follow due procedure..
Now you will cry had I know had I know.. They 350k you paid for buying that baby was more than enough for you to have gone for surgery and carry your own baby afterwards. Having fibroid doesn't stop one from having children na. But instead of doing that, you decided to make another woman cry by stealing her baby. Wicked woman. this Omitogun woman loss her husband that she snatched from her friend years ago on Saturday morning just because of her greediness.